Hill and Wang, 9780809078219, 384pp. A horrifying epidemic of smallpox was sweeping across the Americas when the American Revolution began, and yet we know almost nothing about it. Elizabeth A. Fenn is the first historian to reveal how deeply variola affected the outcome of the war in every colony and the lives of everyone in North America. By 1776, when military action and political ferment increased the movement of people and microbes, the epidemic worsened. 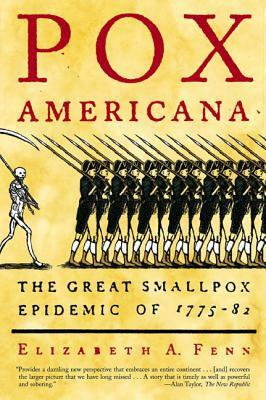 Fenn's remarkable research shows us how smallpox devastated the American troops at Québec and kept them at bay during the British occupation of Boston. Soon the disease affected the war in Virginia, where it ravaged slaves who had escaped to join the British forces. During the terrible winter at Valley Forge, General Washington had to decide if and when to attempt the risky inoculation of his troops. In 1779, while Creeks and Cherokees were dying in Georgia, smallpox broke out in Mexico City, whence it followed travelers going north, striking Santa Fe and outlying pueblos in January 1781. Simultaneously it moved up the Pacific coast and east across the plains as far as Hudson's Bay. The destructive, desolating power of smallpox made for a cascade of public-health crises and heartbreaking human drama. Fenn's innovative work shows how this mega-tragedy was met and what its consequences were for America. Elizabeth A. Fenn teaches history at George Washington University. The author of Natives and Newcomers, she lives in Hillsborough, North Carolina.